Accidents causing arm injuries are surprisingly common for individuals to suffer from, especially as result of how fragile the connections between the wrist and arm are. Arm injuries can be among the most debilitating due to how necessary working arms are for your peace of mind and active function in modern society. If you have suffered from an accident causing an arm injury, then you could likely be entitled to claiming compensation for your accident with the help of a Claims Service. Our company will help you to determine whether or not you claim is worth pursuing, and how much compensation you may be able to claim. A guide to accident claims for arm injuries. What to do if you are involved in an accident causing an arm injury. How to begin an arm injury claim. What can be claimed for after an accident causing an arm injury? What arm bones do you have? The most common types of arm injuries. Assessing the severity of an arm injury. How much compensation will I get after an accident causing an arm injury? An Arm Injury Case Study. No win no fee arm injury claims. Why choose us as your claims service for an arm injury claim? This guide exists to inform and assist you with your personal injury compensation claim for accidents causing arm injuries. It will provide you with comprehensive and accurate information regarding the aspects of your claim that you will need to consider before making your claim, and how you should actually go about the process of making your compensation claim. The guide will also inform you about the evidence that is needed to make a valid compensation claim and the average amounts of compensation that you may receive at the end of your claim; depending mostly upon the type and severity of your arm injury. 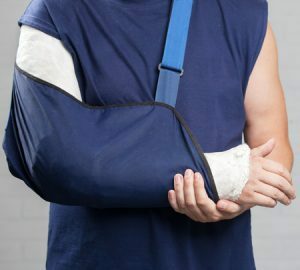 What you need to do if you become involved in an accident that has caused you an arm injury can be initially confusing, but it is important you stay calm. Your first priority should be to attend to any medical requirements caused by an injury, either performing first aid on yourself or seeking medical advice. Firstly, you should gather witness statements from those surrounding your accident. For example, if you suffered your arm injury as result of a car accident then this could include pedestrians walking nearby or motorists in traffic nearby. This is to corroborate your version of events and ensure that your claim is not undermined by possible incoherencies. Secondly, you should find evidence that your accident was as result of negligence on the behalf of another individual or company. To continue our example, if your accident occurred as result of the other party tailgating, i.e. leaving too little gap between cars, then CCTV footage or witness statements should confirm this. Thirdly, you should ensure that you have evidence in support of the severity of your injury. To return to the example, after your accident you were taken from the building site into hospital by ambulance and then given x-ray tests to see whether your arm was seriously broken. This proves the severity of your injury, thereby ensuring you receive the maximum possible compensation. By following these initial steps, you will be well on your way to making a successful personal injury claim following an accident causing arm injury. The process of beginning your compensation claim for an accident causing arm injury is almost certainly much simpler and easier than you will be expecting. With the professional support that our company provides to you throughout the claims process, it could not be easier to make a personal injury claim for broken arm and receive the compensation that you deserve. As previously mentioned, the first step you need to take is to gather the necessary evidence to support your broken arm injury claim. This could include almost anything that you believe to be relevant and in support of your account of the accident and injury. Typical evidence that tends to be used includes witness statements, medical reports, and photographic evidence of the site in question. Next, it can help to seek out legal representation. This can be done either by calling our phone number 0800 073 8804 or filling in a contact form on our website to receive a free consultation over the phone. In this consultation session, we will assess how valid we believe your personal injury claim broken arm to be, depending upon the evidence that you provide. We will then provide you with an evaluation concerning how successful we believe it could be if you were to take your claim to court through our service. This is to ensure you do not invest any more time and money than is necessary into a claim that is unlikely to ever result in you receiving compensation for your arm injury. After this session, we can begin the process of bringing your compensation claim to court. We will also conduct further fact-finding, possibly by looking at CCTV or arranging local medical assessments to evaluate the severity of your arm injury. We can arrange for you to visit a doctor in order to evaluate the severity of the injury. These steps help to ensure that the maximum amount of compensation is reached. Then we will begin legal proceedings. Thanks to our ‘No Win No Fee’ policy, we even won’t charge you legal fees unless we are successful in arguing your case, making the process almost danger-free. General damages – this includes unspecified damages such as pain and suffering as result of the arm injury, effect upon your life, and loss of reputation stemming from the arm injury. Special damages – this includes measurable damages such as direct loss of earnings, cost of home-care required by your arm injury, and damage to your property. Travel costs – this includes the cost to travel between your home and hospital appointments and potentially travel to foreign countries if treatment is sought overseas. These various costs and damages directly show you the number of different things that you can claim compensation for in relation to your arm injury caused by an accident. However, the driving force behind how much compensation you are determined to receive stems heavily from the type and severity of your arm injury. The Humerus is the uppermost bone in your arm, connecting your elbow and shoulder. This results in a broken Humerus affecting your elbow and shoulder as well as your arm. This affects you if you are attempting to make a broken Humerus claim or receive a fractured Humerus settlement it tends to lead to severe injuries, which have higher compensation amounts. The Radius is one of the two lower bones in your arm, connecting your elbow with the inside of your wrist. The proximity between the Radius and wrist can lead to serious medical consequences, especially a distal Radius fracture. This will affect you when attempting to make a broken Radius claim as it will result in a moderate, but relatively smaller compensation amount than the humerus. The Ulna is the other of the two lower bones in your arm, also connecting your elbow with your wrist, although in this case the outside of your wrist. This will also affect you when you attempt to make a broken Ulna claim as the area of connection is fundamentally weakened. Tendonitis is the most common type of arm injury, being an inflammation of the tendons between the muscles and bones in your arms. Common symptoms of tendonitis to watch out for include weakness/stiffness in your arm, a grating sensation in your arm, or swelling in your arm. Sprains are a different common type of arm injury, being a tearing or stretching of a ligament in your elbows. Common symptoms of a sprain you should look out for are swelling around your elbow joint and painful bruising that does not easily fade. Dislocation is another common type of arm injury, being the shifting of bones out of their proper positions. Common symptoms of a dislocation that you need to look out for are joint numbness, significant swelling at the joint, and bones appearing to visibly be out of place. Broken bones are the most obvious and well-known type of arm injury, being simply the breaking of one of the three bones in your arm. 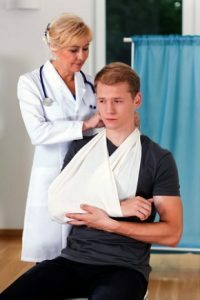 While obvious symptoms of a broken arm include your arm being bent at a strange shape and a snapping noise when you are injured, others include simple bruising or swelling around the area of injury. Your arm injury will be considered to be of only minor severity if the injury has an effect upon you, but not a particularly significant nor long-term one and is easily treated through medical care. Arm injuries of this level of severity, such as sprains, rarely receive large amounts of compensation. Your arm injury will be considered to be of moderate severity if the injury still has a minimal effect upon your life, but still has a long-term effect that is not easily treated. Arm injuries of this level of severity, such as soft tissue damage, also rarely receive large amounts of compensation but do receive significantly more than injuries of minor severity on average. Your arm injury would be considered serious or severe if the injury has a great impact upon your life and requires extensive medical treatment to assist with. Arm injuries of this level of severity, such as permanent muscle/nerve damage, receive large amounts of compensation due to their long-term effect upon your life. Finally, your arm injury would be considered very severe if the injury is permanent and requires the removal of one of or both of your limbs. Arm injuries of this severity, such as severe necrosis or blood poisoning, receive the maximum amount of compensation due to the permanent effect of the injury and extensive medical treatment required over your life to ensure no further complications arise. When you consider making a personal injury claim for compensation after an accident has caused you an arm injury, the most pressing issue for you is likely to be the amount of compensation you could receive. Unfortunately, compensation such as average compensation for broken wrist or average settlement for fractured Humerus can vary considerably based upon individual cases and general principles are difficult to determine. As you can see here, the amount of compensation that you could receive can massively vary even within the same severity of injury. For example, elbow injury compensation amounts vary between £9,525 and £41,675. However, what can be clearly seen is that the type and severity of injury does matter to a large degree when considering how much compensation you could receive for you arm injury accident claim. If you are still weary about making a compensation claim, try to become inspired by a real example of an individual who went through similar issues as you are now going through. This claimant was struck by a trolley that became out of control and suffered soft tissue trauma to their arm as well as emotional suffering and bruising on their face. The claimant received over £1,000 for her claim directly as result of her arm and facial injuries. This shows you how your arm injury claim could turn out; you can succeed in your personal injury claim. You simply need the support of an excellent Claims Service such as our company to get you through this difficult period in your life and ensure you get the most out of your claim. The aspect of making a personal injury claim for an accident causing arm injury that causes most people’s reluctance is the legal fees that you could be charged for attempting to get compensation, regardless of whether you claim is successful or not. These legal fees may be charged against you by your Claims Agency and can cause further worry and stress. If you are already experiencing financial issues as result of your accident then such fees can appear excessive, hurting you when you are at your most vulnerable. Even worse, your fees may even exceed your compensation and leave you at a loss. However, our company will ensure you experience none of this stress during the claims process. If you choose our company to represent you, we will ensure your claim will succeed with our focus being entirely on the best outcome for you. Our ‘No Win, No Fee’ Policy guarantees your financial stability throughout the claims process. This policy, also called a ‘Conditional Fee Agreement,’ ensures that we will do our best to win your case as quickly and efficiently as possible. We promise to only charge for our services on the condition that we win your compensation claim in court; if your claim fails, you won’t have any legal fees or debt to add to your worries. This provides a safe and stable base for you to successfully claim arm injury compensation for your accident. As a company, we promise to support you throughout the claims process, regardless of your initial wealth, and ensure that you receive the maximum possible compensation that you deserve for your injury. When you decide to make your personal injury claim after your accident involving an arm injury, you need the strong support of our company as your Claims Advisor. Our years of experience in dealing with personal injury claims places us as one of the most capable companies for dealing with claims for accidents causing arm injuries. It has enabled us to gain a deep understanding of how to maximise your chance of being successful in seeking your personal injury claim and achieving your maximum potential compensation amount. Our team of legal experts will ensure that your personal injury claims dealt with efficiently and professionally both in and out of court. They can assist you in your claim along every step of the process, and give you premium advice on how to proceed with your personal injury claim for arm injury. Our desire to see justice done in the world is highlighted by our ‘No Win, No Fee’ policy. This emphasises our company’s commitment to justice, especially for those who believe that cannot receive it due to their financial status, and limits the amount of stress that you will face throughout the claims process. We can even arrange for a local medical evaluation to strengthen the evidence you have in support of your claim. In short, we are by far the best company for dealing with personal injury claims and you should choose us as your Claims Service. If you believe that you have a legitimate claim for an accident that has caused an arm injury, and even if you are just wondering about your situation after an accident, you need to contact us as soon as you can. You can begin the process of your claim by contacting us either by filling in the contact form provided or calling the number below, and then we can begin the process of getting you justice and compensation for the accident you suffered. Call 0800 073 8804 now, and our company is able to provide you with free advice on how to proceed with your claim and how much compensation you could receive. Arm injury pain is common and arm injuries are usually caused by a slip trip or fall accident in a public place or a accident at work. Check out this NHS link on guidance of what to do to help with the pain and recovery. Find out how much compensation for can claim for a injury at work, slip trips and falls are very common causing a arm injury. Slip Trip of Fall Compensation Claims Find out how to claim. If you have suffered from a slip trip or fall and want to claim compensation contact us today for free advice. Have you slipped on faulty pavement? start a compensation claim today.